The potential of digital print is constantly broadening, and its benefits for packaging are only just being realised. In terms of customer engagement, personalisation, and re-usability, digital print has opened up a whole new world of opportunity. As the print quality has improved, the advantages of digital print have become clearer. In 2016, we will see more digitally printed packaging on retail shelves than ever before. With millennials now considered the most influential generations, the behaviour of brands is changing. Packaging is consistently identified as one of the major influences on everyday purchase decisions and with generations engrossed with anything visual, packaging design characteristically outweighs the practical attributes of a product. The challenge that is faced by brand owners now is how to leverage digital print to drive profit from innovative marketing campaigns. With customers desire to connect with brands on all levels, brands have to work harder to get their market share by offering consumers a truly special experience with their product. Personalisation is the latest buzzword and has become a novel way to reach out to the masses. We have seen this from big brands such as Coca-Cola, Nutella and Marmite who have utilised digital print technology to personalise their bottles and jars. In 2013, Coca-Cola started their infamous ‘Share-A-Coke’ campaign. The campaign saw them print 100,000 of the most popular names on the Coke bottle labels all over the world. This delivered a 6.8% increase in their global Facebook community and their values sales have increased 4.93% year on year since the campaign started. Personalised packaging has proven popular amongst brand owners. It can give brands more direct contact with customers and strengthens the relationship that they are trying to build. Digital print has enable personalisation on a scale that wouldn’t be possible using the more traditional printing methods. Packaging has always been interactive. The look, the colour and the shape are just a few elements that subconsciously impact our perception of a brand. As mentioned, the design of the packaging for many is more important than the actual product attributes itself. With this in mind, digital print has allowed brands to explore interactivity with use of electroluminescent inks and conductive inks. 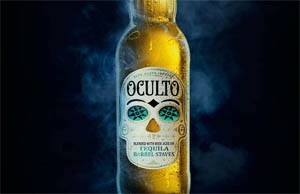 Oculto, a lager blended with beer aged on tequila barrel staves recently unveiled two new interactive packaging innovations. These included a first-of-its kind illuminated bottle design that featured smart label technology. The smart label was created using electronic pathways, paper batteries and LED lights that were activated with a pressure switch. The switch was placed where the thumb naturally falls while holding a beer bottle, and once pressed; the LED light began to shine. This technology was a clear demonstration of how packaging and marketing can give customers a full sensory experience. Brand owners aren’t just concerned with marketing gimmicks though; they are much more concerned with the practicalities interactive packaging can offer. Packaging for prescriptions could soon connect to your phone to give you a reminder when you need to take your next dose. Researchers are also working on an early-warning system that enables packaging to sense changes in the condition of the packaged food. Smart labelling and colour changes would be used to transmit those changes informing the consumer their products are no longer fresh. This development in intelligent packaging could dramatically reduce food waste. As a nation we have become more conscientious about our waste and the UK now has the fastest growing rates of recycling in the UK. With that in mind, brands are working to transform packaging from otherwise useless receptacles into useful items. Last year saw Ogilvy and Mather Tokyo turn Pizza Hut’s cardboard box into a working film projector. Powered by the user’s smartphone, the box contained a small lens which was inserted into a perforated hole in the side. When the user’s smartphone was placed in the box, the screen was displayed onto the wall. Brands are also striving to make new technology accessible to all through their packaging. 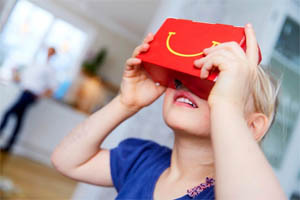 When Google released Cardboard, its paper-and-velcro VR headset, the guys over at McDonald’s Sweden noticed an opportunity. In March of this year, McDonald’s began selling a limited number of Happy Meals in special boxes. With a little construction, these could be transformed into VR headsets. By tearing eyes and nose holes and inserting lenses, kids got free a VR headset. Customers who bought one were then also given an access link to download the Happy Goggles VR game, an animated skiing-race game called ‘Watch Out on the Slopes’. Investing in this new and exciting technology has proven a smart way at making consumers feel involved with a brand. Retail continues to change at a dramatic pace and the demand for personalised and engaging experiences call for new approaches to packaging. With end users making the move to digital, print is now the major player in bridging the gap between physical products and the digital world. We are constantly pushing the boundaries with print. We also house some of the latest digital print technology that will allow you to produce dynamic and personalised marketing print assets that will open up channels to your customers and products.